Given however that Customs & Border Protection has little interest in shutting down more than about 30% of illegal traffic at the actual border due to CBP corruption and the impact of enforcement operations on cross-border commercial traffic, one can see why the Border Patrol continues to shift its dog and pony show away from actual border enforcement activities and towards interior enforcement operations that significantly interfere with domestic traffic. It’s not like there isn’t already a component of Customs and Border Protection who’s job it is to conduct interior immigration enforcement operations (see ICE’s Enforcement and Removal Operations division). There’s much demand however from federal, state and local enforcement agencies for an increased Border Patrol role in domestic enforcement operations. The Border Patrol, after all, has been able to get away with doing something for decades that other enforcement agencies can’t. 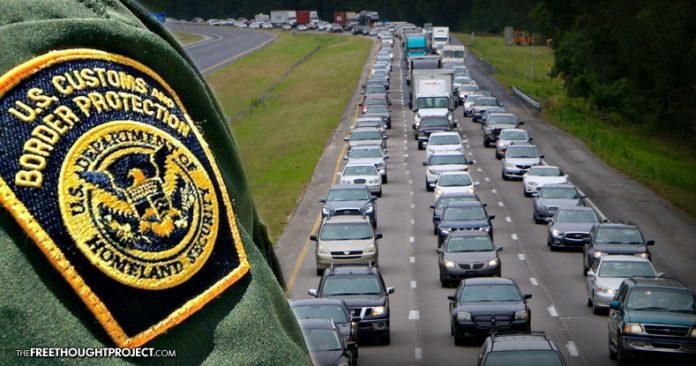 It declares that suspicionless roadblocks setup along highways inside the country are limited scope immigration enforcement operations and the agency is magically allowed to do whatever it wants, despite legal and constitutional protections that are supposed to be in place. This includes indiscriminately running drug dogs around vehicles while stopping, seizing, detaining, interrogating and searching people inside the country absent any reasonable basis to believe they’ve violated any law whatsoever, let alone federal immigration law. Agencies such as ICE’s ERO, the Drug Enforcement Agency (DEA) and local law enforcement recipients of Operation Stonegarden federal grant funds benefit greatly from such unconstrained general enforcement roadblocks. As such, these agencies never raise a stink when the Border Patrol operates roadblocks under color of law. Similarly, many judicial courts that are brought into the mix turn a blind eye to Border Patrol excesses at these interior roadblocks instead of doing their job to protect individuals from executive branch over-reach. A few recent news stories which highlight the Border Patrol’s renewed interest in clamping down on freedom of movement inside the country follow. The first set of stories deal with a roadblock recently setup by the Border Patrol in New Hampshire nearly 100 air miles South of the international border with Canada. During operations, the Border Patrol worked closely with local law enforcement agencies such as the Woodstock Police Dept., agencies that are undoubtedly recipients of federal Operation Stonegarden grant funds. Additionally, you’ll note that the vast majority of apprehensions made during the operation were either for drugs or known aliens who had overstayed their visas. Very few, if any, of the apprehensions were associated with individuals who had illegally snuck into the country across an international border. Aliens who overstay their visas are the primary responsibility of ICE’s ERO division, not the U.S. Border Patrol. As such, trying to justify the use of a very blunt instrument like a suspicionless roadblock that seizes everybody along a highway in order to apprehend a few aliens that the government allowed into the country to begin with is an abuse of power and a gross violation of the rights of individuals seized absent reason to believe they have done anything wrong.